Fruit vinegars are usually made from soft fruits such as blackberries or raspberries, bilberries and currants. To make a wonderful fruit vinegar simply follow this ultra easy recipe. To each kilo of ripe fruit add one litre of best distilled malt vinegar. Place in a porcelain bowl, cover with a cloth and leave to stand for 3-5 days, stirring occasionally. Strain and add 1k of sugar to 1lt fruit vinegar and boil for 10 minutes. Store in sterilised, glass bottles. Plums make more robust vinegar good for flavouring meat sauces! 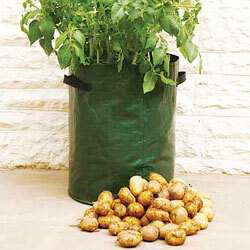 Growing fruit and vegetables in containers is massively popular – many of us do it and many of us know why. It’s easy, it’s accessible, it makes weeding a whole lot easier and, arranged with a bit of artistic finesse, a collection of pots can look mighty fine, too. Of course, there are restrictions and pots do need different maintenance to plants growing in the ground, so here are some pointers: volume is key.The less of it you have the more demanding your potted fruits will be. Very few fruit crops will be happy in small pots – strawberries are the only real candidate. Lingonberries and cranberries might suit, too, but these need permanently moist compost. Water-demanding crops like pears, peaches and plums require a half barrel as a minimum (dwarf peaches can be given smaller). Choose thick-walled tubs and avoid porous materials like unglazed terracotta. When in growth your fruit’s roots require constant moisture, plus regular additions of liquid potash. It’s that tricky balance of keeping things damp enough but not waterlogged. Irrigating in the evening will minimise evaporation, as will applying mulch. Make sure there’s a gap of 3cm between the mulch surface and the top of your pot, else the water you do apply will simply spill over the edge. Move pots into the shade (the leaves and stems can still be in the sun) and avoid windy sites as this can cause rapid moisture loss.